It was a daily ritual to spot Hanoi’s most outrageous load that one of the 35 million registered motorbikes in Vietnam was carrying. We’d seen just about anything and everything loaded onto the small 100cc two wheelers. Lumbering beer barrels, whole vegetable market stalls precariously balanced, mopeds on the back of mopeds, towers of caged birds, and families of at least four. 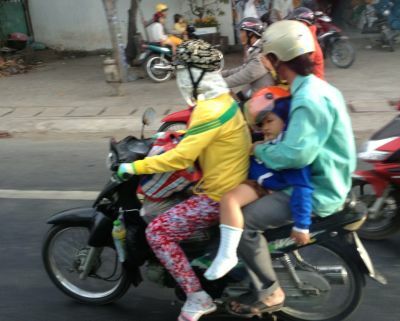 With a motorbike for every third person it is the leading mode of transport in this densely populated country; and the riders’ capacity to perform a daily city ballet, with excessive loads, somehow enables all road users to negotiate the clogged arteries with minimal disruption, and more importantly few accidents. This slow but steady approach is best witnessed from the front of a Cyclo, a reverse three-wheeler pedalled by an extremely lean but strong local. These somewhat precarious vehicles are also a great way of getting around Hanoi’s centre to view the gently blended mix of traditional and modern Vietnam. Temples from the 11th century Confucian era sit alongside 21st century luxury shopping malls, whilst the best in heritage from its many occupancies link the centuries together. The country has been at war with one dynasty or another for most of its existence but since 1975 peace has reigned. This has allowed the country to look forward with visitors now being warmly welcomed. Tourism is escalating and more airlines, notably Finnair, are increasing their routes. 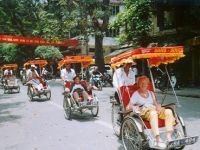 History, culture, local entertainment, amazing food and more besides are all on offer in Hanoi. For context a visit to the fabulous Museum of Ethnology is a must. Located a couple of kilometers out of town it is a fabulous guide to the complexities of the many ethnic minorities that populate Vietnam. Traditional instruments, trading objects, shamanism, videos of village rituals, some alarming – slaughter of water buffalo – others bizarre – the healing tree ritual – all outline the rich diversity of Vietnamese culture. Mr Pham Ngoc Uy’s bike hidden by 800 different fish traps – he cycled around for 15 years selling the traps from his bike and only stopped in 1997 is a highlight and details such as this make it a gem. 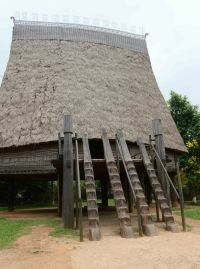 The grounds feature typical houses that have been relocated from around Vietnam with the imposing Bahna communal house leaving a lasting impression. To experience light-hearted traditional entertainment a visit to the Hanoi Water-Puppets, whilst somewhat surreal is worth the thirty minute diversion. Highly stylised puppets are manipulated to dance on water by puppeteers knee deep in water standing behind bamboo shields. Vignettes of rural life and historic events are accompanied by traditional musicians and singers. Visit the Museum of Ethnology before to avoid leaving the theatre somewhat bemused. The Temple of Literature is Hanoi’s most revered temple complex. Dating from 1070 the five walled courtyards are said to represent Confucius’ birth place. Entering the Van Mieu Gate visitors pass the Well of Heavenly Clarity, a rectangular pond inspiring thought. On either side of the pond 82 Stelae stand on the backs of tortoise. Whilst the tortoise represents longevity the Stele records details of 15th to 18th century Temple scholars for this is Hanoi’s first seat of learning which taught the Royal children in the 11th century, then became Hanoi’s first university. Today it is far from peaceful as the many local students come to make offerings in the elaborate red and gold enamelled temple whilst Confucius sits overseeing the devotees. Eating plays a major part in Vietnamese life. The day invariably starts with a rice noodle soup featuring a delicious broth accompanied by beef (often water buffalo) or chicken whilst lunch and dinner will feature freshly purchased meat, fish, veggies and the ubiquitous bunches of herbs that accompany most meals which include morning glory leaves, pumpkin leaves, bamboo roots, banana roots and a fields worth of herbs. The food is incredibly healthy with fresh meat and fish in the spotlight. Mrs Quyen’s cookery school is worth a visit. A half day spent with her in the garden kitchen learning the art of mixing fresh ingredients to create mouth watering dishes full of taste and textures both inspires and satisfies the stomach. Mrs Quyen is patient to a fault and does not mock the clumsy Western hands trying to create the tomato rose or the delicate summer roll. For fine dining visit The Press Club to meet Vietnam’s media past. Before 1997, when the economic reforms of the Doi Moi area were being established and international political posturing was coming to an end, the Press Club along with the Sofitel Metropole, was the only place international media could meet. Now it offers elegant private dining rooms serving elaborate multi course menus in cool and relaxed environs. A similar proposition The Restaurant Ly Club is inspired by the legacy of the Ly dynasty and presents a modern twist on Vietnamese classics and traditional colonial cocktails. This capital city is a treasure trove of foodie delights and is certainly worth a visit by any epicurean. BTN will shortly feature a detailed review of Flying at the Front End with Finnair.